Your roof bears the brunt of South Florida’s harsh winds and blistering sun, which can take a toll on its life expectancy. So, how do you make sure your roof stays in good working order for as long as possible? 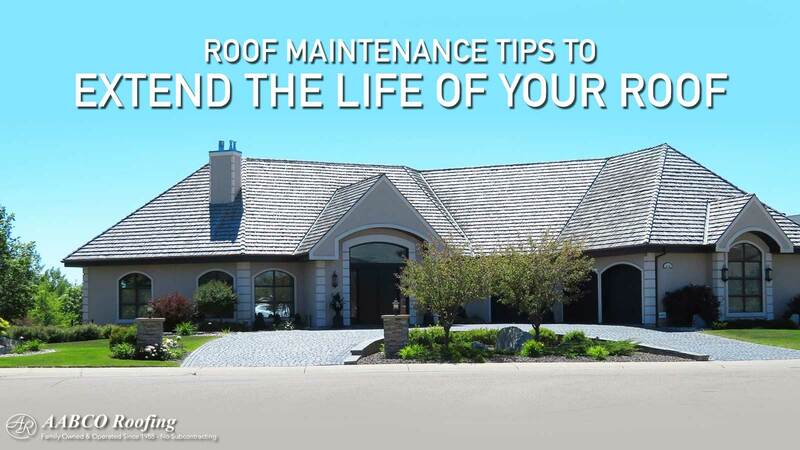 Luckily, Aabco Roofing has you covered with these 5 top tips for roof maintenance! Although there are many websites that offer tips on how to DIY roof maintenance, we often see DIY projects gone wrong. Roof maintenance is risky, particularly because getting onto your roof without proper safety gear is dangerous for both yourself and your roof. When Aabco Roofing maintenance technicians climb on to your roof, they do so with the utmost care and precision to ensure that your roof isn’t damaged in the process. Just remember, if you try to DIY a roofing problem you run the risk of making it significantly worse or damaging other areas of your roof. But one of the primary issues of DIY roof maintenance is the fact that roofing technicians are trained to find small problems that the average person would miss. It’s very possible that a tiny crack goes unnoticed by someone trying to inspect their own roof, whereas a qualified technician would pick up on the issue immediately and resolve it before it becomes a serious problem. Hiring a roofing company to regularly maintain and check-up on your roof is one of the best ways to extend the life of your roof structurally and aesthetically. During a maintenance check-up, Aabco Roofing will inspect your roof to ensure that it doesn’t have any cracks, leaks or structural damage. Because your roof protects you from the elements, it is subject to serious environmental damage, yet it often goes neglected for years on end. Scheduling regular roof maintenance check-ups with a qualified roofing company will ensure that your roof will remain safe and secure, both on the inside and the outside. That’s right, at Aabco Roofing we make sure to inspect the interior and the exterior of your roof, as well as ceilings in your home or commercial property. You’ve probably already heard someone mention the importance of cleaning out your gutters. Often the response to this is “surely the wind will blow away any leaves or debris?” Unfortunately, this isn’t the case, although many people assume that their gutters will clear themselves. Roof gutters allow water to run off your roof, so when they are clogged water has nowhere to go. Often this results in rooftop puddles, which eventually create leaks in your roof that can be costly to repair. Rather prevent a leak by regularly cleaning your gutters. Overhanging trees can cause many problems and significantly reduce the life expectancy of your roof. Not only do the leaves clog your gutters, the tree branches themselves can also damage your roof. Just a single branch consistently rubbing against one point of your roof will, over time, knock off shingles, create leaks, or damage the structure of your roof. To top it off, overhanging branches pose a serious threat during hurricane season when high winds can blow off branches, or provide rodents and other creatures easy access to your attic. To ensure your roof is protected from any tree-related issues, make sure to keep branches at least 10 feet away from your roof. Although a professional roofing company like Aabco Roofing will thoroughly inspect your roof during routine maintenance checks, at the end of the day you know your roof best. Make sure to listen out for any cracking or creaking sounds that suddenly occur, and take note of any missing pieces. If you see debris on top of your roof or can’t get the leaves out of your gutter and need assistance, don’t try and fix the problem yourself – rather contact us for help. At Aabco Roofing, we want your roof to last as long as possible. No matter what roofing situation you’re under, we will work hard to get on top of it and provide you with the end results you are looking for!